Attack 1:  Legend Ceremony - Search your deck for both halves of a Pokemon LEGEND, show them to your opponent, and put them into your hand. Shuffle your deck afterward. 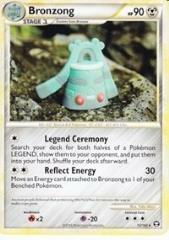 Attack 2:  Reflect Energy (30) Move an Energy card attached to Bronzong to 1 of your Benched Pokemon.